dry eye | Bio Logic Aqua Research® Technologies International, Inc. 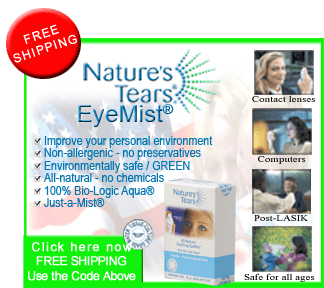 Recent discoveries by Bio-Logic Aqua Research have resulted in Nature’s Tears EyeMist, the first all-natural, pH balanced water mist product to soothe dry eye symptoms. Correctly application of the eye mist is important for maximum benefit. Soothes computer eye strain (also called “Computer Vision Syndrome” or CVS). Will not “run” eye make-up.